Joe Proski, the original athletic trainer for the Phoenix Suns, has a love for sports memorabilia that is only rivaled by his love of collector cars. Joe grew up in Green Bay, Wisconsin, and like most residents of Green Bay he is a life long Packers fan. His father worked for the Packers and was able to get star wide-out Don Hutson to attend Joe's fifth birthday party and give Joe his autographed #14 jersey. While Hutson's jersey is Joe's most revered memorabilia item, his 1950 eggplant-purple Mercury has been his most treasured automobile. Joe even refused an offer from coaching great Pat Riley, a former Suns player, who was enamored with the purple Merc. When Joe agreed to completely update the Mercury he had some tough decisions to make. To finance the customization, Proski sold a few of his custom cars including and orange Buick Riviera (Are you catching on to the orange and purple theme?). He was even able to convince his wife, Jan, to sell her Chevrolet Impala SS to help finance the customization. To restore domestic peace, Joe agreed to sell his coveted Don Hutson jersey. Joe isn't saying how much he was able to get for the Hutson jersey or how much the customization cost, but the result would probably make the late Packer very proud. 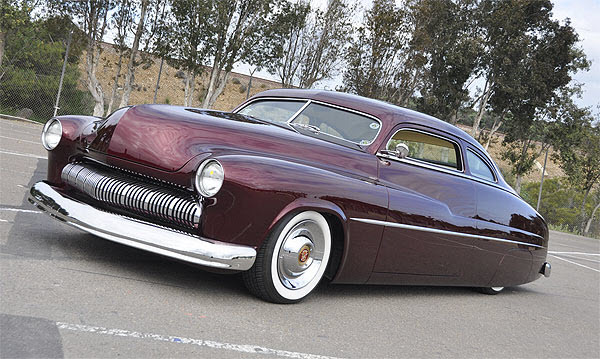 Joe's 1950 Mercury has been winning awards in custom car shows across the country and was recently named Goodguys 2011 Mother's West Coast Custom of the year. The customization took two and a half years to complete. Even though the Mercury looks spectacular, Joe still drives it to competitions. “Plus, it's a driver," says Joe. “We drove it out to Del Mar, and these guys at the show were like, ‘Are you out of your mind? Don't you have a truck and trailer?'" For custom car shows, Joe displays a plaque next to the Mercury which gives special thanks to "Don and Jan."